Today I took my son to San Francisco to train with Stevan Gengo Sensei at Aikido of Noe Valley. Before my incredibly long period off the mat this was my home dojo. 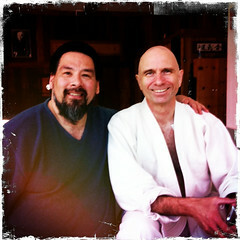 I love training with Steve as he is always offering an interesting perspective on Aikido. He stays true to O’ Sensei’s teachings and today talked about Ai (triangle) ki (circle) and do (square). Today he used an ushiro version of koto gaishi to demonstrate how these shapes represent the intention of movement and direction at the start of a technique, the spiraling and circular nature of Aikido through the technique and ending the technique with a solid and substantial frame. I enjoy visiting Steve and have always enjoyed being his student. His Aikido seems to have grown. He seems like he moves with smaller circles, exerting less effort. Today, he mentioned the three techniques that O’ Sensei says we should practice everyday, Taino Henko, Kokyo Ho and Kokyo Dosa. In class Gengo Sensei is always working through things in his head to offer up for the next technique. It’s fun to watch the gears move in his head as he walks around class. Most of all, I enjoy his demeanor. He is a truly gentle soul and always makes me feel welcome and encouraged. I look forward to training with him again in the coming months.